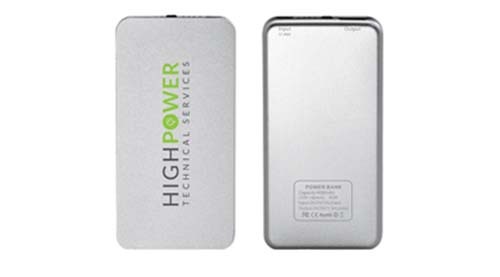 This is our external power bank for PC, tablets, Smart Phones, and other portable products. The power bank will fully charge an iPhone 6 using less than 80% of the charger. Need more power? We have a larger external battery charger available. Order Now! Our local team of professionals is available seven days a week to assist with your order. Find out about our latest products, services, and exclusive deals by subscribing your e-mail! High Power Technical Services is an authorized retailer of DISH Network L.L.C. DISH, DISH Network and DISH Network logos are trademarks, registered trademarks and/or service marks of DISH Network L.L.C. and/or its affiliate(s). The DISH Network trademarks, registered trademarks and/or service marks are used under license of DISH Network L.L.C. and/or its affiliate(s).